It seems that my containers running on the docker have problems listening to the 443 port. I tried to change the domain of the discourse site but seems the web condition is not so good, that caused there being an “app.yml.swap” file and the ssh connectivity stopped. Error starting userland proxy: listen tcp 0.0.0.0:443: bind: address already in use. Where is this hosted? Is there another webserver already on the machine? NO. There’s only one docker and only one discourse running on the server. Well something is listening on 443, and as you’ve evidenced in your list it’s not docker. I think its the letsencrypt of the former website‘'s fault. 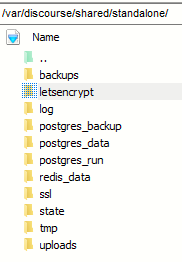 I simply deleted the old letsencrypt folder “AAAA.com”, now there only being a folder of “BBBB.com”. And now the website works fine. If there’s a website on the machine in addition to a discourse install you can’t free up 443 just by renaming the site. Your server can only have one application listening under that port. If you netstat -tulpn | grep 443 what’s the output? What is the output of that?